Demonstrative adjectives are simply adjectives that are used to modify or describe a noun. Grammatically, they are necessary so that one knows which specific person, place or thing is mentioned. 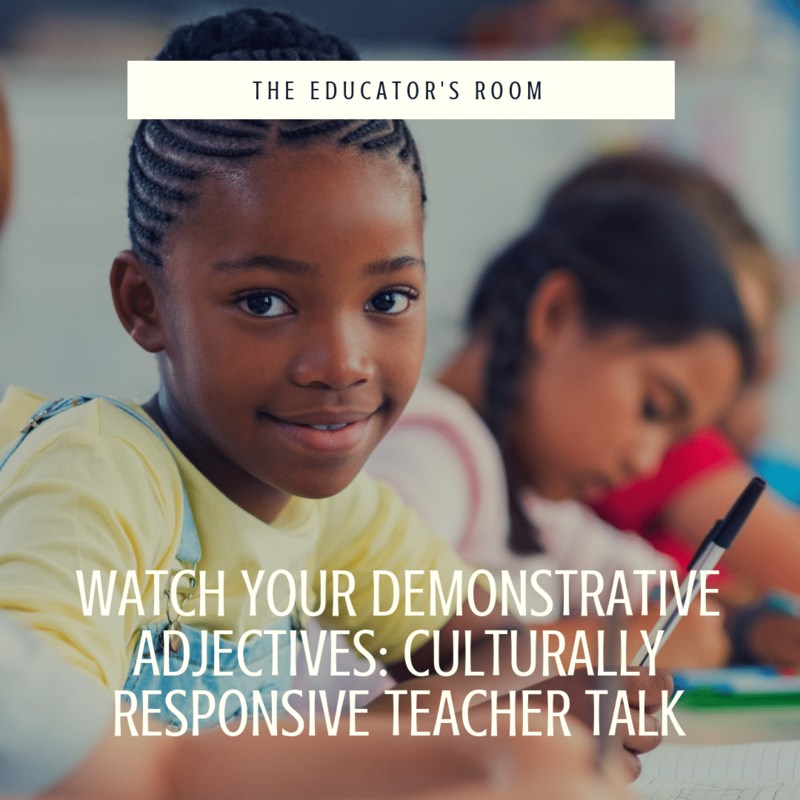 In the context of language and grammar study, demonstrative adjectives are important; however, in the context of teacher talk, these types of adjectives can be detrimental. It is unfortunately all too common to find these adjectives used in conversations to vent frustrations about certain student groups or academic levels. But you know, those kids…..
Often these phrases are followed by frustrations of an unwillingness to work, lack of achievement, or an emphatic description of why kids will not succeed. Harmless? Just venting? Nothing deeper? I beg to differ. As cultural responsiveness becomes the latest trending topic for professional development across districts, we would be remiss if we didn’t take the time to truly evaluate our own speech as educators. Student relationships are paramount and what we say, think, and feel are translated into our instruction. Let’s not be naive in thinking that our words don’t matter, or that they don’t bleed into mindsets about students. Typically, when teachers are using the terms “these and those kids” they are referring to either low performing students, students of color, or students with behavioral or linguistic challenges. Using these terms to reference a marginalized group of students is simply not culturally responsive. In the words of Zaretta Hammond, author of Culturally Responsive Teaching & the Brain , as told to Cult of Pedagogy, “For students who have been marginalized and don’t feel welcome, that relationship becomes important because you want them to actually do the heavy lifting of the cognitive work, (and) that’s not going to happen if you can’t get the student to be in a trusting relationship.” Establishing student relationships is key to academic progress and success. When teachers create a detachment in their speech about students (these/those kids), this detachment can also come across in their relationship with their students. Kids are very perceptive and our words and actions reach deeper than we can fathom. We need to choose our words wisely in and outside of the classroom because what we speak will internalize and become prominent in our instruction. Think about it. If teachers are translating negative attributes to “these and those kids,” what high expectations do they truly have for students? Deficit thinking is when we blame the student solely for their failure. As educators, we have all experienced students who lacked motivation and drive. Students who did not place their priorities in the same order as we would have liked. Nonetheless, as educators, we also know that there is always a reason. A backstory. If kids had all the tools, they wouldn’t need us to guide and provide instruction. This unrealistic or mismatched scope of expectation is partly what fuels frustration and deficit thinking. “These kids can’t get through this paragraph. They can’t even bring supplies to class.” Instead of focusing on the deficits (what you feel they cannot do), focus on where they are and what they can do. Also, the better matter to seek is to analyze why they are having difficulty. What is the stumbling block and how as a teacher, can you remove or lesson that block? Additionally, we should be cautious about our expectations as sometimes we place responsibilities on students for areas in which they have no control. Supplies, timeliness to school, and home support are often areas in which students receive reprimands from teachers. Are students truly able to control what parents may or may not do? How can we support students in the midst of these circumstances while still holding them accountable for their portion? Building relationships and REALISTIC expectations are how kids who know they are loved and valued will rise to the occasion each and every time. While I believe that most teachers truly have a heart for kids, I also know how quickly one can get caught in the derogatory loop of those adjectives. Managing students at varying levels and personalities is challenging. However, we have the opportunity to change lives. We have the opportunity to help create better citizens. We have the opportunity to impact the world, daily. So, since we have such a duty for impact, what happened to reference kids as “our students” and “my students”? Demonstrative adjectives create a clear separation from teacher and student, while possessive adjectives create a connection. We need educators to be connected to students in a way that fosters growth, progress, and success. How often, especially in our current climate, are students hearing and seeing messages of division and separation? I challenge educators to think about how our words impact our craft. John C. Maxwell’s quote alludes to this idea, “People may hear your words, but they feel your attitude.” Saying we care about students, but subconsciously or consciously thinking, “these/those kids can’t/won’t…” prevents students from being pushed into to their full potential. Challenge yourself to be more intentional about the verbiage you are using in reference to kids; especially if you are typically in an environment of negative speech. Use words that edify, connect and foster understanding. If you find yourself frustrated with your students’ actions or progress, try reframing the problem. Dig deeper and begin to ask questions before you place labels and constraints on their abilities. Ask why? Search for the breakdown in understanding or any barriers that are preventing students from being successful. Often we realize that sometimes that barrier is us. Change your adjectives. Change your thinking. Change THEIR lives.